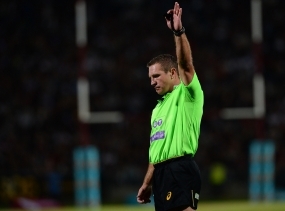 Still an active referee, though he is lately more inclined to sit up in the TMO box than on his feet down on the field, Lourens van der Merwe was recently elected the chairman of the Free State Referees' Society, a man who has done much for refereeing in South Africa. This week, despite exam time at Grey College, he is still answering readers' questions. Thanks for your question as it's a very practical and relevant one. From your question, I assumed the scrum didn't wheel through the 90 degrees, but only that Red is scrumming illegally. Taking this into account, we should take a look to see if advantage can be applied or should the penalty be blown by the referee? Thus, from Law 8.3, it is clear that advantage can be played as the scrum didn't wheel through the 90 degrees, therefore the try should be awarded. Question: In 2000 it was set in law that the nearest a line of touch could be to the try line was 5 metres. There seems to be some inconsistency as to where the players are set at such a line-out. Should the 5-metre line be in the middle of the line-out or should the defending side be placed on this line? If the latter is done, surely it disadvantages the attacking side? Admittedly only a small amount but that may make a difference in some circumstances. Thanks. Keeping the game fair is priority, even if it's only a small margin. The intention of the law is that the contest for the ball can't restart closer than 5m from the goal line. According to Law 19.8 (o) The line of touch must not be within five metres of the goal line. So to answer your question: No team is being disadvantaged, as the contest for the ball starts 5m from the goal-line. The mere fact that the attacking team's players are taking up a position within the 5m, is no disadvantage to them. Question: My question relates to the tackle. Often a player with the ball in his possession breaks away from the coached attacking play and makes a brilliant break, often running away from support players. The defending team eventually tackle the player and a second defender (not the tackler) goes in on the ball immediately. He is the closest player to the tackle situation because the attacking player is running towards defenders away from his supporting players. The referee will most of the time penalise the tackled player for not releasing the ball. What has happened to the law which says a tackled player must be allowed to place the ball after being tackled. Has this law been scrapped? if so, in my opinion, it discourages "out of the box" thinking and makes rugby more stereotyped and boring. There are two factors to look at here. Firstly, the arriving player is not part of the tackle and therefore he has the right to go straight for the ball. He doesn't have to 'show daylight' (release) as he's not part of the tackle. Secondly, what does the ball-carrier need to do according to law when tackled? (b) A tackled player must immediately pass the ball or release it. That player must also get up or move away from it at once. According to Law 15.5 (b), the tackled player must immediately pass or release the ball. Your question re the right of the tackled player to place the ball is applicable only when the tackler wants to play the ball. The fact that the ball-carrier ran away from his support players is in my view poor execution by the attacking team. The defending team can't be held responsible for poor judgement by their opponents. Question: I am old enough to remember the days when scoring a try was rugby's grand achievement. The referee acknowledged this by blowing his whistle, standing to attention on the try-line where the try was scored and raising his arm - a salute to the try. Now it sees that the try - like other things - doesn't matter. The referee just wanders off from anywhere up field of the try-line, with no care of where the try was actually scored and no salute to the achievement. Surely to goodness this is unwarranted, arrogant carelessness. Why is it becoming the fashion? Is it an instruction? Is it an affectation? I admire your passion for this game we all love! I must admit, I have never thought of a try being saluted by a referee. It is a brilliant view point, and I think this attitude should be taught to especially young referees. I am of the belief that referees don't mean any disrespect when awarding a try in a 'careless' manner. This would occur when there is a runaway try, for example an intercept try. It is a formality for the ref to blow the whistle and award the try. As referees, we always try to be as invisible as possible as the game is not about the ref. The motto: "less is best" is adopted by this action, and shouldn't be interpreted as arrogant or careless.